After a week of rain, I have finally been able to shoot some new content. We had a full week of rain last week to the point I thought I was living in Seattle for a minute. I have been dying to wear this dress but was just waiting for the summer weather to show up. It has all of my favorite elements, ruffles, pinstripes and it's off the shoulder. It's non-maternity so I just sized up and I love the comfortable fit. Lately, I feel like all I wear is dresses because it's so comfortable to accommodate the bump. Below I linked a ton of summer dresses for every budget! I can't believe Memorial Day is upon and although it's not the official first day of summer I consider it the unofficial beginning of summer. The pool in my complex will be opening this weekend and I honestly can't wait. I heard swimming is a good exercise during pregnancy plus swimming is so relaxing for me. What are your plans for Memorial Day weekend? Hope you guys have a great Memorial Day weekend! Thanks babe, it's so comfy too! 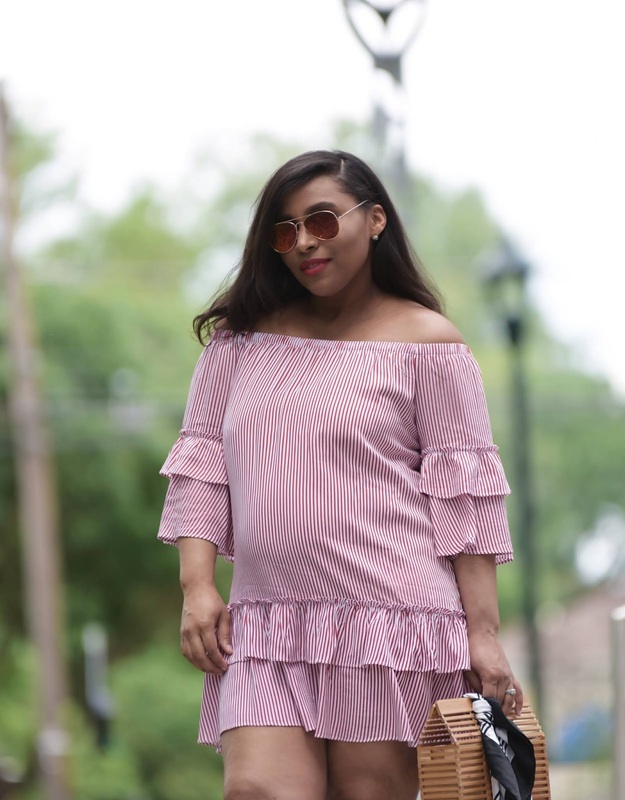 The perfect summer dress for the most beautiful mom to be.